With a Greek name that translates as ‘foreigner’ or ‘hospitality’, I feel a special Hellenic connection. One of my favourite places in the world is the spectacular island of Santorini in southern Aegean Sea, a jewel among Greece’s 2,000 islands, where I spent my honeymoon. However, following worrisome developments in Greece over the past few months, many tourists have developed a phobia for Greek waters and islands this summer, akin to ancient seafarers wary of sirens’ deadly song. With tourism being the lifeblood of the country’s economy, Grexit and the loss of holidaymakers carries a double curse. I first heard about APIVITA from a Greek friend who introduced me to this fantastic brand established, incidentally, in the year I was born. 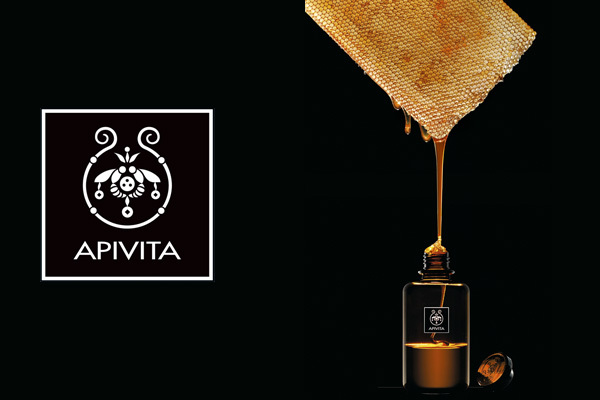 The founders of APIVITA, two young pharmacists Nikos and Niki Koutsiana, were inspired by the honeybee society, the unique biodiversity of Greek nature and the holistic approach of Hippocrates to health, beauty and wellbeing. Together they created their first natural cosmetics, using beekeeping products and herb extracts. I particularly love their revitalizing facial mask with orange that brings zest to dull skin. Another great Greek brand is TRASH4FLASH, an upcycled jewellery line designed by Katerina Stamatopoulou. “Over-consumption has led to the over-possession of products, which tend to become useless; just plain objects at the end of their life cycle… The creation of artifacts using discarded materials is now coming into play in order to redefine art & fashion, in this case, the art of making jewellery,” reads the company manifesto. Check out her gold coloured chocker necklace – there’s absolutely nothing trashy about it! Last but not least, no Greek goddess outfit would be complete without a pair of bespoke sandals. According to an ancient Greek myth, the gods and goddesses had their sandals made on the beautiful island of Crete by a gifted sandal maker who embellished them with his personal signature… a “golden wing” buckle. Today, Ancient Greek Sandals are handmade locally by skilled craftsmen using chemical-free, naturally tanned leather. The brand is the brainchild of Christina Martini who used to design footwear for the likes of Balenciaga and Louis Vuitton, and her winged creations have been worn by numerous celebrities and even actors during the Olympic Flame lighting ceremony. I hope that these gorgeous green-and-glam Greek goodies will be to your liking. And I also hope that, taking cue from ancient myths, Greece will overcome its current challenges to rise again — like a phoenix from the ashes.